Can you believe it?! I can’t! I don’t know what most people do with their 8 week old babies, but you all know what we do. We’re still trying to get into a routine, which I guess is normal. Mostly I’m trying to get in to work more often. 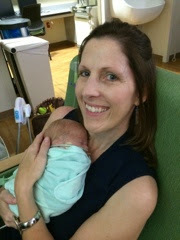 I know this is hard for all new mommies, but I’m having a really hard time leaving the hospital! I know I’ve said before that it’s a time warp. Well it really is! That combined with pumping every 3 hours (for 30 minutes plus set up and clean up each time) and it feels like I just get there and it’s time to leave! 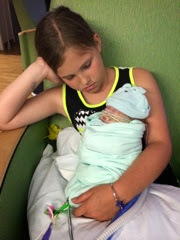 I know the babies are in great hands (seriously we have the best doctors and nurses anyone could ask for) but I just want to hold them and watch them sleep all day! Enough about me. I know you really just want to know how the boys are doing this week and see some cute baby pictures. 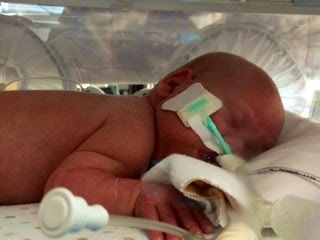 Nothing like Mason’s huge transformation last week but we have made some progress this week (and only 1 minor set back). 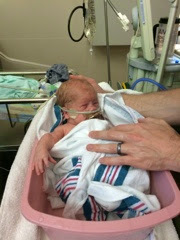 Oh but we did move to a new room in the NICU this week. We were in East, which is for the smallest babies. Mason, Logan and James are big boys now! And they don’t usually have babies in bassinets in East but they let us stay as long as possible until they got new smaller babies. Now we’re in Pod 1 with bigger babies. And they cry! It’s so much louder in Pod 1! James was not a fan at first. He actually got another baby moved somewhere else because he was so upset! He’s still not a fan but he’s getting used to the noise. Mason has had a great week. 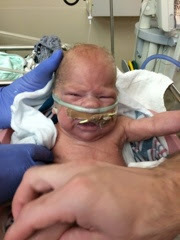 He is on cpap now and he’s doing great! He’s been on around 30% oxygen most of the week. 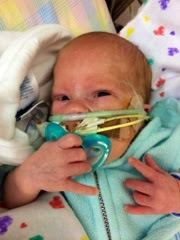 Next step is the straight oxygen nasal cannula. Mason has also been getting oral stimulation occupational therapy. Basically the therapist works with him to practice sucking and to get him used to things in his mouth and touching his face. He’s doing great. He also started getting speech and physical therapy this week. Speech is obviously to teach him to speak different languages (or to work on oral stimulation too). Physical therapy is to work on range of motion so he can hopefully catch up developmentally (they will be delayed because they are so premature). Other that that no major changes for Mr. Mason. Today was Logan’s turn to have a big day! 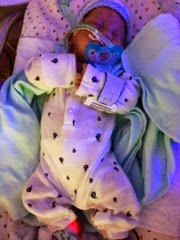 He got off the jet ventilator today finally! I have a good feeling about it too. Hopefully he can stay off the jet this time! (We need his PIE to stay gone). So far he’s doing great! In fact his blood gas tonight was better than it’s ever been. Yay Logan! Logan also got to start eating again today. Last week they stopped feeding him and ran a bunch of tests because his belly was distended and he had blood in his stool. This can be a sign of NEC, a belly infection that we really don’t want. Luckily all the tests came back negative except a minor urinary tract infection (completely unrelated to NEC). 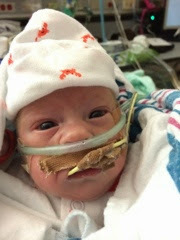 They treated this but just to be sure they did 7 days of antibiotics and held his feeds the whole time. Now he’s starting back over at the beginning. So he gets 5 ml (1 tsp) every 3 hours. We are taking things slow with Logan though. He does better with slow changes. We got to hold Logan this week too! 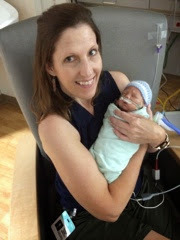 Apparently they don’t usually let parents hold babies on the jet ventilator. But they let both of us do it this week! I think the respiratory therapists and nurses learned some new things thanks to Logan! 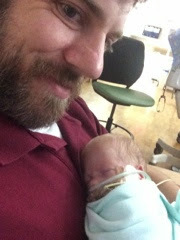 This was the first time Brian has held Logan since he was about a week old! James has been pretty cranky this week. I think it’s mostly because he has pretty significant reflux. Poor little guy! 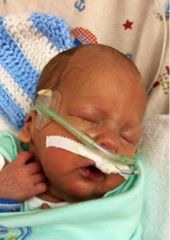 There’s not much they can do for reflux in a premature baby. Most of the medications don’t actually treat reflux; they just make it easier to tolerate. The problem with these meds – they increase the risk of NEC (which we really don’t want). So they switched James to TPT feeds. 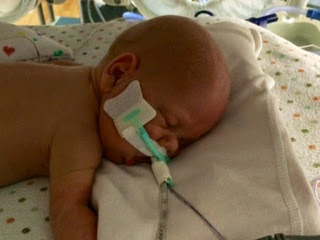 This means that they put the milk straight into his intestines (through a feeding tube that goes through his stomach). 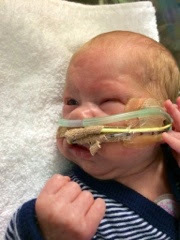 He was still pushing a lot of gastric juice (I don’t think that’s the official name for it) up into his OG tube though. This caused his electrolytes to get out of whack. So (and I know this is gross) they started feeding that back to him (also into the intestines). And today he started a 14 day course of medicine to hopefully help with gut motility. We will just watch his belly extra close now. 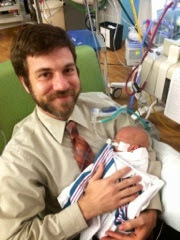 Because of the reflux issues, James had to go back on cpap then back on nippv. 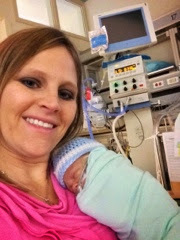 His lungs weren’t inflating all the way with just the oxygen nasal cannula and they weren’t able to wean his oxygen requirement. As of right now, James’s problems are not respiratory, but we want to take whatever steps are necessary to make sure it stays that way. 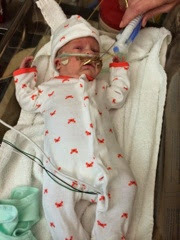 So far on nippv he’s been doing pretty well and he’s on around 30% oxygen. Hopefully we can go back down again soon. 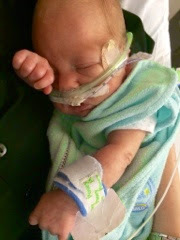 What all of this means is that James has a few more weeks added on to his NICU stay. But I’m ok with it. Whatever he needs! James is also getting occupational therapy, speech and physical therapy like Mason. He’s doing ok so far. Here’s some pictures of James. He makes the funniest faces! All in all we’ve had a good week. And Mason and James got some snuggles from Teresa this weekend! Last but definitely not least, we are so happy that we got some new primary nurses this week! We had been having the same nurses all the time but when Mason and James started getting better we started getting random nurses every day. I’m so glad we are getting are usual nurses again now! They know our babies so much better!